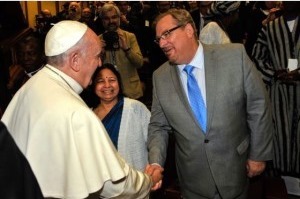 As the evangelical world in America seems rather excited about the Pope’s visit, I can’t help but remember how I felt when I discovered the Evangelicals and Catholics Together document ( ECT). The only way to heaven in the Roman Catholic Church is through Baptism. Baptism cannot save anyone, especially a newborn. A baby cannot have faith. A baby cannot confess Jesus as Lord, he cannot believe the resurrection. Instead each human being at some point in their life must repent of their sin and trust in Jesus as savior and Lord (Romans 10:9). Ultimately, as we see so clearly written by their own fingers, they believe that you must merit God’s forgiveness. It is not a free gift (Eph. 2:8-9 ). It is something that you must earn, and anyone who says they are on their way to heaven without having earned it over the course of many years, is presumptuous and disillusioned. 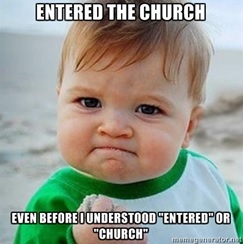 This entry was posted in Apologetics, Contemporary Issues, The Church. Bookmark the permalink. Thanks for sharing this piece. I found it interesting and thought provoking. It didn’t even touch on some of the things that made me say no to Catholicism, like the exaltation of Mary and prayers to saints, and even the papacy. It did enlighten me on their other teachings, which I wasn’t all that familiar with. Here’s my issue though. I don’t, personally, feel a burden to evangelize to people who have already learnt about the gospel and Christ through the Bible, and settled on a false truth. As hard as it is for me to put up with the differing interpretations and practices which send people running from Christ, I would much rather keep speaking the truth about the gospel to the world and be a light to all, than try to get people (who probably feel they know much more than I do about the scriptures) to change their perspectives. However, I think it’s important for people to know that there’s a distinction and we are not all right! It took me a while before I could reject certain versions of Christianity as false, such as Catholicism, Mormonism and Jehovah’s Witnesses. However, I don’t see them in the same light as I see unbelievers (who have never heard or received the gospel) or atheists. I would disagree with them, but the idea of going to them to tell them about Jesus seems like a futile exercise. I think God will always lead the sincere out, because any who truly believes in Jesus and abides in Christ cannot live in darkness. Perfect love casts out fear! But I do understand that for some people (like you, perhaps), this type of Ministry if their focus. It definitely has its place in exposing lies and helping people to choose true Christianity. However, where does it end? I mean, where are the boundaries? 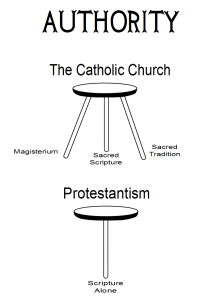 Even among Protestants, beliefs and practices are so varied and some Protestant churches seek to save other Protestants too, by claiming that they’re correct and the others are misguided. Maybe we will always live in the tension of these differences. Jesus said “if they are not against us, they are for us” at one point, then “anyone who doesn’t gather with me scatters”. If “US” is the body of those who believe in Jesus, then maybe Jesus is saying those in other fellowships are not our enemies. But what is important is for each one of us to gather with Christ… otherwise we will be scattered (as we are). Our common ground is Christ. If we hold to Him, we can trust Him to gather us together. I truly believe the Body of Christ is invisible and many individuals and churches will be shocked to see branded heretics in the Kingdom on Heaven and exalted saints cast out. As much as we disagree, let us exalt Christ… the devil would like to distract us from this vocation. God WILL save his elect people no matter where they currently are. I do not personally challenge the faith of any of my Catholic friends, however I believe Catholicism holds to a gospel of faith plus works, which is a false gospel. At the same, there is a false gospel that pervades much of Protestant evangelicalism that tries to ‘attract’ people to Jesus with the message that Christ died for ‘our best lives now’ that is more insidious than Roman Catholicism, that at least teaches that Christ died for our sins. the point of the article is that those who hold to salvation by faith alone should not partner with those who hold to faith plus works salvation. One is a false gospel. For those who hold to a true gospel to partner with those who profess Christianity but hold to a false gospel is the ultimate meaning of being unequally yoked. I also believe that I should pray for opportunities to present the true Christ to those in my life who hold to a false gospel and/or a false religion. The gospel message i have is for all of the lost regardless whether they think they are saved or are just happy pagans. I guess I need to pray for and seize more of such opportunities myself. I think I’m more of a teacher than an evangelist in that respect. I appreciate the purpose and message of the article. I need more boldness to reach out to those who put their faith in a false gospel. That’s a good prayer and one I will join you in.